This Grecian Ebony Urn is hand-cut art glass urn, trimmed with in contrasting silver plate. The softness in style and elegant detail offers a lovely tribute. The Glorious Blue Urn is handcrafted European Art glass in a classic Amphora design. The variegated pattern is a mix of deep blue and clear glass achieving a delightful effect. The Royal Violet Urn is handcrafted European Art Glass in a stunning violet shade. The variegated pattern is a mix of violet and clear glass for a subtle, completely unique effect. The Royal and Ocean Palms Glass Urn is from the Something Special line of urns. Each beautiful 24% leaded glass urn is handmade, hand cut crystal of the finest quality. This urn has the Leaves of Love design in a deep purple, around each urn. Each urn includes a white satin bag to place the plastic bag of cremains. Measures 11 1/2" x 8 3/4"
The Ebony Lattice Urn is finely crafted from 24% lead glass and double cased crystal. These enchanting, imported urns are designed and crafted by world renown master glass artisans in the Czech Republic. Each urn includes a white satin bag for cremains. Once placed in the urn an opaque container is created, allowing the glass to reflect light through each precision crystal cut. Each Celestial Emerald, Purple, and Ocean Glass Urn is breathtakingly beautiful. The variegated pattern is a mix of deep blue and clear glass achieving a delightful effect. Each Cobalt, Ruby, Royal, Singer's and Ethereal Glass Urn are breathtakingly beautiful. The artist has been making these urns since 1990. Each hand made urn is a work of art. The Celestial Cobalt & Rose Glass Urn is breathtakingly beautiful.The artist has been making these urns since 1990. Ruby red is a living and rich color that reflects a life well lived. 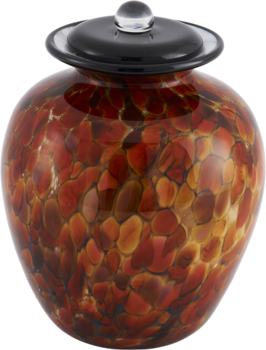 These thick sturdy glass urns will offer a lovely tribute with the joy of rich color and light. The Stately Ebony Urn is finely crafted from 24% lead glass and double cased crystal. This exquisite tower design is carved with sweeping designs etched in crystal. These enchanting, imported urns are designed and crafted by world renown master glass artisans in the Czech Republic. Each urn includes a white satin bag for cremains. Once placed in the urn an opaque container is created, allowing the glass to reflect light through each precision crystal cut. The Stately Violet Urn is finely crafted from 24% lead glass and double cased crystal. This exquisite tower design is carved with sweeping designs etched in crystal. These enchanting, imported urns are designed and crafted by world renown master glass artisans in the Czech Republic. Each urn includes a white satin bag for cremains. Once placed in the urn an opaque container is created, allowing the glass to reflect light through each precision crystal cut.